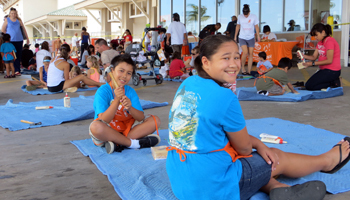 Home Depot Kids Workshop: Building Free Hawaii Family Fun. 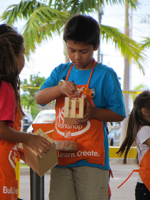 Home Depot Kids Workshop: Building Hawaii Family Fun! 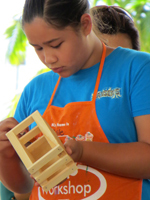 If you’re planning a Hawaii vacation, the Home Depot Kids Workshop is probably nowhere near the top of your Oahu tourism activities itinerary. In fact, unless you are a die-hard, never-miss-a-month collector of the Home Depot projects and pins, I say do this at your local store when you get back home. Besides, you might want to pick up a bucket of paint while you’re there, and I certainly don’t recommend trying to pack that in your suitcase! *Estimated. Actual statistic not available. 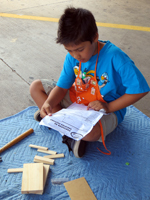 Okay, now that the disclaimers are done, I was planning to tell you about the Home Depot Kids Workshop. Basically, this is a monthly opportunity for your kids to make a purposeful pile of wood out of an unassembled pile of wood. Yeah, that’s about it. 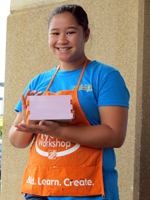 On the first Saturday of each month starting at 9am, every Hawaii Home Depot store invites children ages 5 to 12 to assemble and paint a free wooden model kit (don’t bother getting there later than 10am because every kit will be gone). The projects include things like bird houses, pencil boxes, piggy banks, boats, airplanes, and coasters (which I'm using at the exact moment I’m writing this). These projects teach only very basic woodworking skills – gluing, hammering, screwing, and painting. There is no cutting, drilling, or sanding. Nevertheless, the kids all seem to enjoy it. Your child will receive a free apron, collector’s pin, and project kit. Then when the project is complete, he or she will receive a certificate of completion and keep the craft. I grew up poking around construction sites for fun and then building tree houses and forts out of all the scrap lumber I collected. 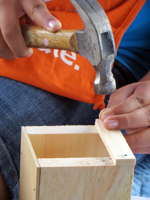 However, since liability concerns, apartment managers, and neighborhood boards all tend to prevent such activities these days, the Home Depot Kids Workshop may be your child's first and only exposure to a hammer (and/or splinter). It’s not just building knickknacks. It’s building character. So give it a go.